I love the look and feel of this soap. 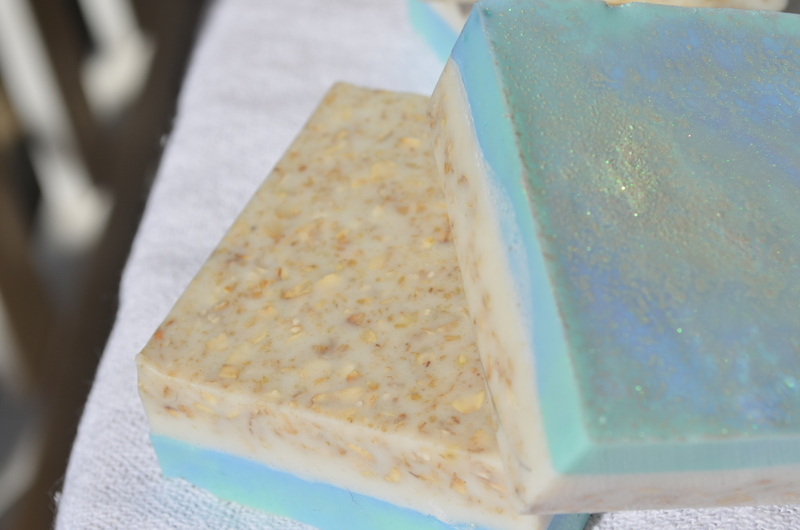 The base is a Shea Butter Soap with oatmeal added for a gentle exfoliant. The top layer is a Goat’s Milk Soap. Both are scented with Brambleberry’s Beach Breezes fragrance. Below, you will see the process in pictorial form, and then I will walk you through, step by step, to achieve the same result. First, you want to gather all your supplies. Cut the melt and pour soap bases into small chunks. Place all of the Shea Butter base into one microwave safe container. Divide the Goat’s Milk base in half, placing each half pound section into a microwave safe container. Melt in the microwave on 30 second bursts. After each 30 seconds, give the container a swirl. You want all the chunks to be melted. If there are still a few small pieces, you can usually stir to melt them in. You want to make sure everything is in a liquid form before adding anything to the base. Once the soap is melted, it is time to start customizing your soap. In the Shea Butter base add oatmeal. I used the rolled Quaker Oats you buy at the grocery store. You know the one, in the huge container that you buy when you plan to make a huge batch of no bake cookies? Add some oats, then stir to combine. Take a look at your mixture. Do you like the amount of oats in the soap? If not, add more. I wanted enough oats to make the base look like sand and enough to make a gentle exfoliant. I really like this soap. It works for both of the Wolves. I especially like it as a face scrub. Once you are happy with the amount of oats in the base, add the scent. I used Beach Breezes. Use as much or as little as you like. The great thing about this is that it is up to your preference. Do you like a ton of scent in your soap? Add more! Do you like just a light scent? Add a little less. Give the oatmeal Shea Butter base a good stir and then start pouring into your mold. I wanted 4 ounce bars so I knew using a total of 1 3/4 pounds of soap I should get 7 bars. I mismeasured and ended up with 6 bars a little over 4 ounces, and 1 a little under. Once it is poured into the mold, spritz with rubbing alcohol to remove any bubbles. Now we can turn our attention to the sea portion of the soap. I added color first. To one half pound cup, I added aqua pearl mica. I used the small scoops, added two, stirred and then looked at the color. Keep adding mica until you get the color you want. Repeat this process on the second cup using a blue mica. I always add less than I think I need at first. You can always add more color, but you can not take the color away. When you are happy with the color saturation, you can add your scent. 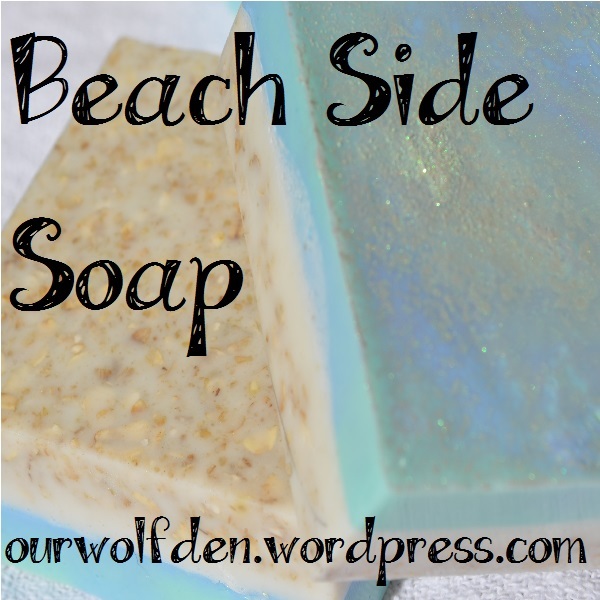 Again, I used more Beach Breezes scent, but you can add a different scent to this section of your soap. Before pouring into the molds, make sure the oatmeal Shea Butter portion has at least a thin skin forming. If not, you will not end up with a clean line between the two sections. Again, spritz with rubbing alcohol to make sure the second layer will stick. Using both cups, I poured a small amount into each mold. Then, I switched, making sure to pour a different color over the first. Repeat this process until you are out of soap. Adding a little bit to each mold and then coming back to add more helps to ensure the same amount is added to each mold. Then, take a fork and drag it though the blue soap that was just poured to swirl the colors. Once the sea portion was poured, I added a small amount of opalescent green mica to a sieve and lightly tapped over the soap. This will give the soap a water-like shine. Again, spritz with alcohol to remove any bubbles. Set the mold aside and allow everything to cool. In a few hours, you can come back and gently remove the soap from the mold. Now, go take a shower and try it out! Or, wrap it up to use later or give as a gift. 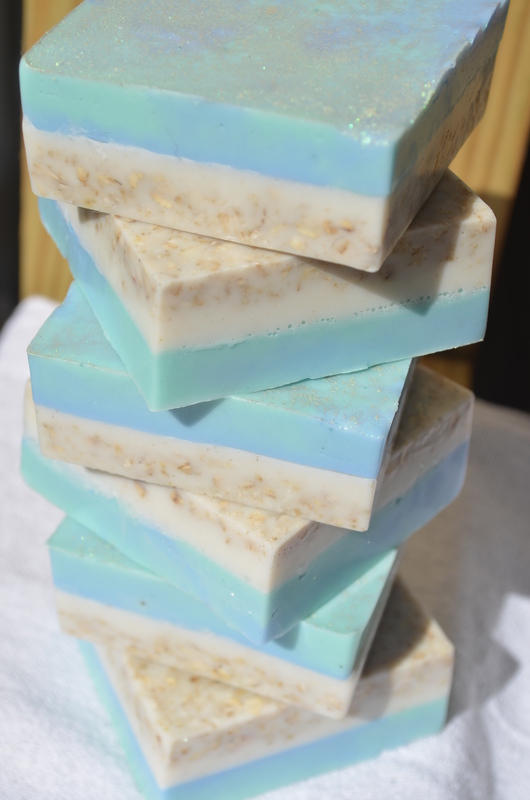 Categories: Melt and Pour, Soap Making | Tags: aqua pearl, blue, goat’s milk soap, homemade soap, Melt and pour soap, oatmeal soap, ocean inspired soap, shea butter soap, soap, soap looks like water, soap making, soap that looks like sand | Permalink. This soap is gorgeous! I love shea butter. Thank you. If feels so good, I have even been using it as a shampoo! One bar does everything. The “Sea” side for body and hair and the “Sand” side for a gentle face scrub. I love how it looks – the colors are so divine! Thank you so much. I was so happy with how pretty the test bar turned out I knew I had to make more of these. They smell heavenly too! Fascinating. I’ve never made soap! But I’m trying candles soon so if I enjoy that maybe I’ll try this too. These turned out really pretty! This is such a great idea. Thx for sharing! They look so cool! Thanks for sharing on The DIY’ers! Thank you! My family thought I was weird getting into homemade soaps, but I really enjoy it! In fact those bars were supposed to be for Christmas presents, but I have already gotten into a few of them for me I like them so much! Gorgeous soap! I want to make this! Thank you! You should! Soap making, either CP or melt and pour really isn’t all that hard. Just do some homework first and you will be fine!